Vermont is fortunate to have Jill Dawson, maker, educator, artist, to inspire us to keep on making with circuits at so many of our events! Jill first learned how to create with circuits at one of the earliest Create Make Learn Institutes. Once she got started making with circuits there was no stopping her. She soon started teaching advanced workshops in paper circuits and eTextiles at Create Make Learn and other Vermont events. It was not long before she started to get request from schools to work directly with their students. 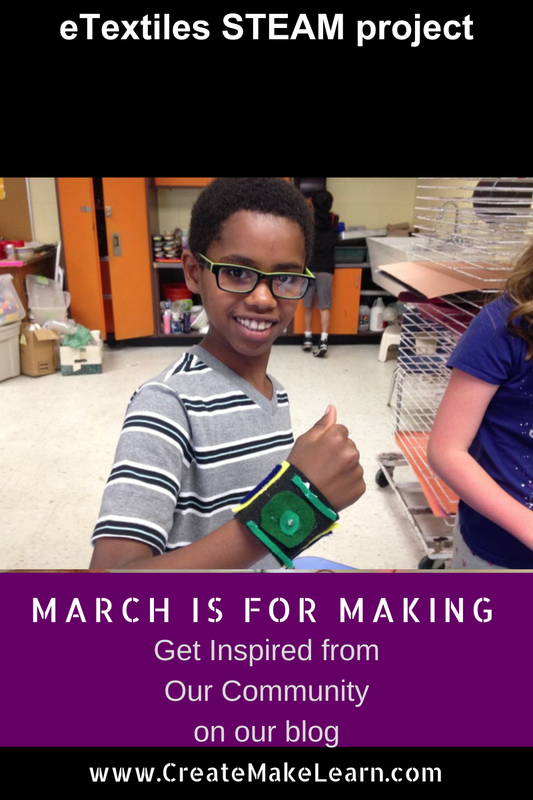 Recently Jill shared her experience teaching 430+ third through fifth-grade students how to create their own electronic wearables (also known as e-textiles) as part of an INSTRUCTABLE contest.- which earned her a prize in the 2017 Teachers Contest. 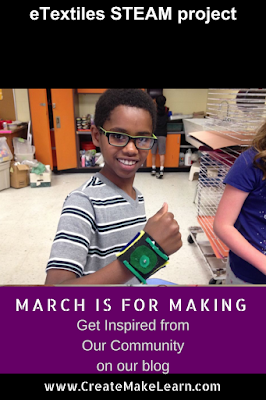 To be truly inspired, check out Jill's award winning Instructable filled with tips on how to empower students to design and create their own light-up cuffs / bracelets as a way to reinforce the scientific concepts of circuitry, switches, and magnetism in a cost effective way. Thanks Jill, for sharing so many classroom tested workflow strategies.
" e-Textiles (electronic textiles), sometimes referred to as wearable electronics, tend to be made out of fabric or incorporated into clothing and accessories. e-Textiles usually combine traditional sewing with modern circuitry. Rather than constructing a circuit with a bunch of wires and a breadboard, circuits in an e-Textile are often sewn onto fabric using conductive thread, LEDs, sensors, and a power supply. While I am far from the most gifted seamstress, programmer, or electrician, I’ve found the process of creating an e-Textile to be a thrilling experience. I take a lot of inspiration from the “learn wearables” category on the Adafruit.com website, which offers tutorials, functioning code, and ideas to remix and build upon. After looking at multiple ways that others have integrated circuits into their wearables, I have begun to find it easier to innovate and create my own designs. Creating e-Textiles with kids is a worthwhile pursuit, because the experience requires attention to detail, persistence, problem-solving, and a basic understanding of how circuits work. Having kids create their own e-Textiles invites them to engage in innovation while offering multiple entry points. Making e-Textiles in class integrates STEAM principles in a fun, hands-on, way with varied levels of complexity, making it a practical way to apply the Common Core Standards and Next Generation Science Standards. 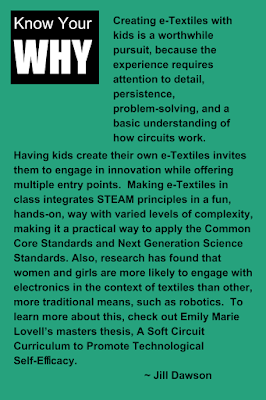 Also, research has found that women and girls are more likely to engage with electronics in the context of textiles than other, more traditional means, such as robotics. 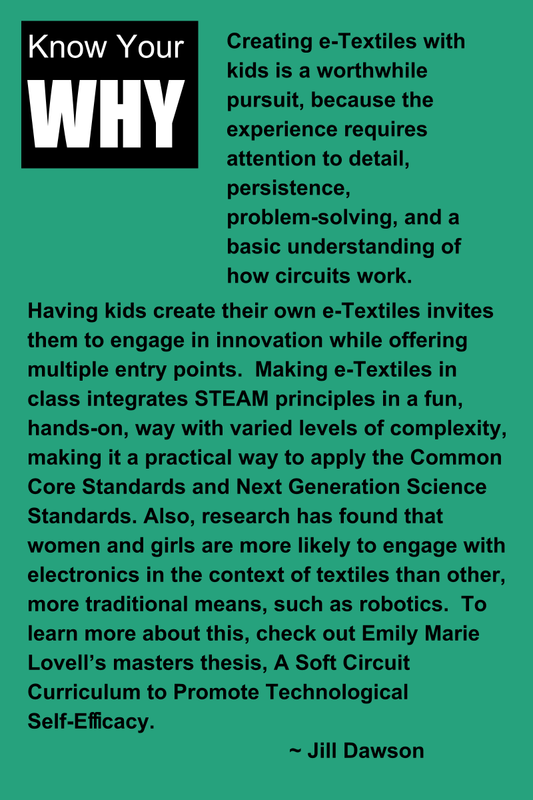 To learn more about this, check out Emily Marie Lovell’s masters thesis, A Soft Circuit Curriculum to Promote Technological Self-Eﬃcacy." March 22 - Making can be SEW fun!